Dispersed volumes are based on erasure coding. Erasure coding (EC) is a method of data protection in which data is broken into fragments, expanded and encoded with redundant data pieces and stored across a set of different locations. This allows the recovery of the data stored on one or more bricks in case of failure. The number of bricks that can fail without losing data is configured by setting the redundancy count. Dispersed volume requires less storage space when compared to a replicated volume. It is equivalent to a replicated pool of size two, but requires 1.5 TB instead of 2 TB to store 1 TB of data when the redundancy level is set to 2. In a dispersed volume, each brick stores some portions of data and parity or redundancy. The dispersed volume sustains the loss of data based on the redundancy level. Dispersed volume configuration is supported only on JBOD storage. For more information, see Section 21.1.2, “JBOD”. For optimal fault tolerance, create each brick on a separate server. 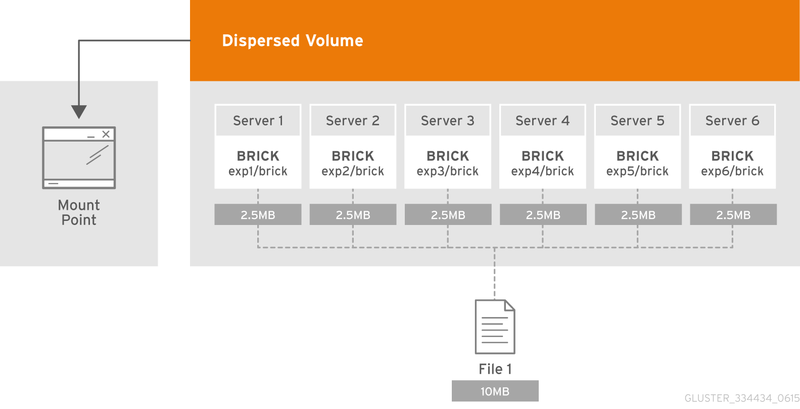 Creating multiple bricks on a single server is supported, but the more bricks there are on a single server, the greater the risk to availability and consistency when that single server becomes unavailable. Use gluster volume create to create different types of volumes, and gluster volume info to verify successful volume creation. Create a trusted storage pool as described in Section 4.1, “Adding Servers to the Trusted Storage Pool”. Red Hat recommends you to review the Dispersed Volume configuration recommendations explained in Section 5.9, “Creating Dispersed Volumes” before creating the Dispersed volume. Run the gluster volume create command to create the dispersed volume. The number of bricks required to create a disperse volume is the sum of disperse-data count and redundancy count. The disperse-data count option specifies the number of bricks that is part of the dispersed volume, excluding the count of the redundant bricks. For example, if the total number of bricks is 6 and redundancy-count is specified as 2, then the disperse-data count is 4 (6 - 2 = 4). If the disperse-data count option is not specified, and only the redundancy count option is specified, then the disperse-data count is computed automatically by deducting the redundancy count from the specified total number of bricks. Redundancy determines how many bricks can be lost without interrupting the operation of the volume. If redundancy count is not specified, based on the configuration it is computed automatically to the optimal value and a warning message is displayed. The default value for transport is tcp. Other options can be passed such as auth.allow or auth.reject. See Section 5.3, “About Encrypted Disk” for a full list of parameters.